Developed from the basic Mi-8 airframe, the Mi-17 was fitted with the larger TV3-117MT engines, rotors, and transmission developed for the Mi-14, along with fuselage improvements for heavier loads. Optional engines for 'hot and high' conditions are the 1545kW (2070 shp) Isotov TV3-117VM. Recent exports to China and Venezuela for use in high mountains have the new VK-2500 version of the engine with FADEC control. The designation Mi-17 is for export; Russian armed forces call it Mi-8MT. The Mi-17 can be recognized because it has the tail rotor on the port side instead of the starboard side, and dust shields in front of the engine intakes. Engine cowls are shorter than on the TV2 powered Mi-8, not extending as far over the cockpit, and an opening for bleed-valve outlet is present forward of the exhaust. Literally dozens of countries operate the type in both military and civilian roles, making it one of the most widely used medium lift helicopters around. 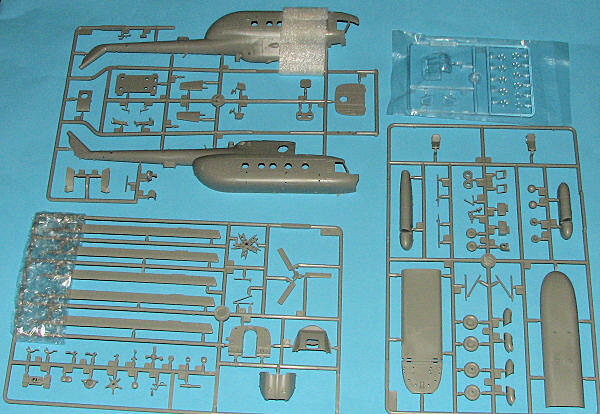 This Hobby Boss kit is typical of their higher priced model kits. There are four sprues (three of grey plastic and one clear) each packaged separately with the bagged clear sprue in with one of the others. Hobby Boss wrapped the forward section of one fuselage half and the hub attachment area of the rotor blades with additional bubble wrap to protect them. I found no parts knocked off sprues from shipment as is sometimes the case with other kits. The detailing is very good with the usual engraved panel lines where expected and raised where needed. In fact, It is almost redundant to even talk about the detailing of most modern kits unless it is below standards, but it does take up space when one is scrambling to take up some room. Never let it be said that Modeling Madness would go on and on without actually saying anything in an article. I mean, it just isn't done. Is it? Anyway, the kit has a fairly nicely detailed cockpit and includes both flight controls as well as a nicely done pair of instrument panels. There are dial faces only on the panels and the seats are without belts, again, standard 1/72 stuff for most. The cabin area is devoid of any detail, but there are aftermarket items for this kit that will provide that if you want it. Other items on the kit are a rescue winch, lower cockpit armor plating and a radome. There are also cabin stairs and one can pose the door to the cabin open (to show an empty cavern). Though the instructions imply that one can have the tail rotor on the left side of the airframe, for this kit, it should be on the right, as all the markings options show it so. The main rotor blades are not molded with any droop so one will have to add that. Instructions are well drawn and provide color information in the Gunze range. I'm sure this will need some sort of nose weight, but where one will put it is beyond me as there is little room under the cockpit floor. Perhaps putting it in the side sponsons would be an option. Now for markings. First is the box art plane of the Czech air force. This has a large and somewhat goofy shark-mouth and is painted in the two-tone green over light blue color scheme that just about all WarPac countries used. The black exhaust area is also on the sheet. Next is an Iraqi helo with brown, tan and green bands over light blue. The final option is a Chinese Army version from 2008. It has some additional items on it that are not on the previous aircraft and the instructions point this out. It is in a tan and dark brown wraparound scheme. Two complete serial number options are provided, but the sheet has enough additional numbers that one could do any one of several Chinese helos if one has a photo. 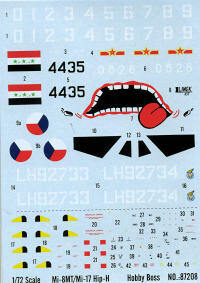 The decal sheet is well printed and includes the rotor tip warning stripes. 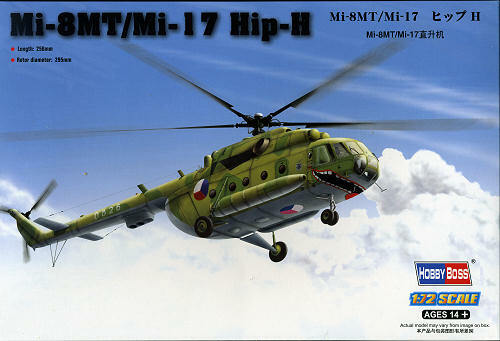 Though not the only 'Hip' kit on the market, it may be the only one that does an Mi-17. Mi-8s have been done by KP and Zvezda, both at a lower retail price than this one from Hobby Boss. One thing for sure, this one is probably easier to build than those others, especially the KP kit which is raised panel line technology. No helo collection should be without this one on the shelf. Thanks to me once more for providing this one for you.